Remarkably, the working process of this new Conterfeyter painting about Diogenes will start by picking up a piercer and sticking a hole in the canvas. This apparently destructive act is however the result of several accurate calculations. Although in this new painting a combination of tonal, color and atmospheric perspective will have to be used, at this first stage it will be all about linear perspective. 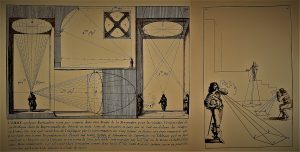 Considering that ‘naer de natuer’ drawing and painting is about a three dimensional illusion on a two dimensional surface, one might call the knowledge of perspective one of the elementary tools to create that illusion. When the famous printmaker Abraham Bosse (c.1602/04-1676) published his influential book on the fundaments of perspective and other technical aspects of depiction, it immediately gave him a widespread recognition but it also embroiled him in a controversy with some of his apparently envious colleagues at the newly established Académie royale de peinture et sculpture. Although his “Manière universelle de M. Desargues, pour pratiquer la perspective par petit–pied, comme le géométral, ensemble les places et proportions des fortes foibles touches, teintes ou couleurs” was published in Paris in 1648 with royal approval, these technically advanced instructions were also believed to distract the genius’ inspiration instead. In 1661, Bosse was even forced to withdraw from the Académie, of which he, as one of the founders, had been a honorary member since. 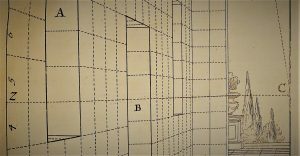 Nonetheless, his knowledge, influence and teachings on the knowledge of perspective have always been highly appreciated – and his famous publication has remained one of the historical standards within the field. After this small but inevitable sidewalk into the history of perspective, we are back in the Conterfeyter studio, where by now we only have a rather annoying pin hole in the canvas. 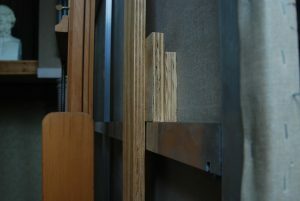 It is just large enough to hammer a small nail through the the linen fabric into an improvised piece of wood which is temporarily attached on the back of the painting, in order to prevent the vulnerable fabric from tearing under the coming weight. 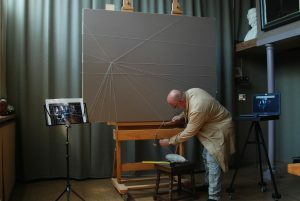 Working directly from several photographs of the posing session in the Galerij Prins Willem V, it is time now to transfer this design to the canvas by using a calculated magnification factor, not only to determine the exact location of the vanishing point of the scene, but also of all the other essential perspective lines. If you can compare making a painting with something like building a house, at this point we would be at the stage of driving the piles firmly into the ground. 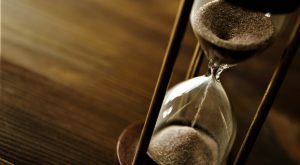 Which of course should be done accurately, because all subsequent additions will be based on these fundaments. After that very exact job is completed, the fun part is almost ready to start. 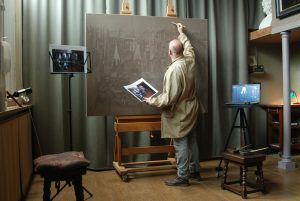 First, if necessary by using the same magnification factor, one for one the different parts, objects and figurants of the photographed scene can be transferred to the canvas as well. This phase of painting looks more like drawing with a brush. 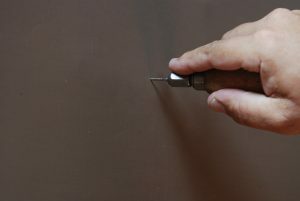 A basic mixture of oil paint in a neutral grey brownish color (‘dead color’), strongly diluted with turpentine oil, is applied with a rather course hog hair brush. Working like this in wet oil paint, corrections are easily made by wiping off the to be corrected parts, which would be much more difficult if a common drawing tool like a pencil would have been used. 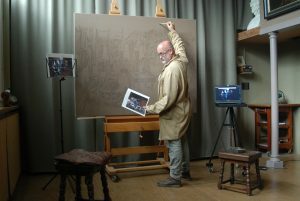 In the following phase of the painting process, it is more about loosely drawing with three brushes, in the same way it was taught in Rembrandt’s seventeenth century studio as well. 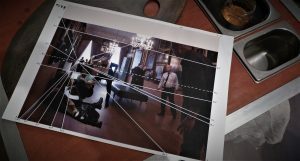 Because from the moment that all the linear elements are in place, the next step in building up the illusion of the scene will be painting some of the shadows and lighter parts. This is done by adding some white to one part and a mixture of brown and black to the other part of the previously used oil paint. Like this the entire under painting will be performed with three pork brushes in three plastic trays filled with three tones of the same color. From the moment of putting the nail in the canvas to this point, it has already taken several days of work. Because this painter altogether will have only three weeks to perform the entire painting in the Galerij Prins Willem V, it was cleverly decided to gain some extra time by already working on this rather time consuming preliminary and preparatory first stage in the studio instead. Rene, wat is dit interessant en leerzaam, bedankt dat je deze kennis op zo’n manier wil delen!